Ahem!!! it has been nearly a month since I posted a recipe. 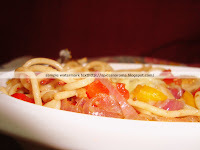 I had no time to even log into my blog.I am feeling too guilty for it and today I made up my mind that come what may I am gonna post my dish. Trust me, it is so very difficult to get back to routine. Even though I do have time to cook and post, I am totally getting lazy from doing things what I have been doing all these days. I started my blog with a jet speed posts of about 18 recipes in Sep and then I havent been posting anything at all . :-(((((( (too bad huh). My apologies to Uma, Sreesha, Usha and Shama for not acknowledging them immediately for sending me those lovely awards. Sorry! 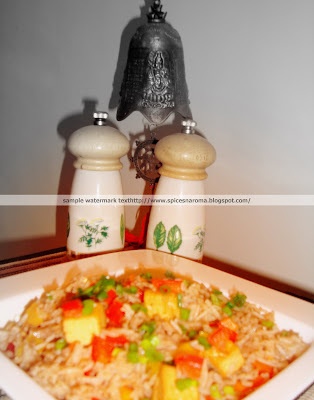 Now the food I cooked few days back was VEG STIR FRIED RICE. It has been raining heavily in Chennai and the weather was extremely pleasant. That made me wear my cooking hat after a long time and I was all set to cook some Chinese delicacy. I was thinking about Chinese fried rice the whole day at work and my taste buds had began to crave for it since that afternoon. I purchased bell peppers, tofu,mushrooms, spring onions on my way back home. I made my way straight to the kitchen to cook them and the table was set for dinner by 7 pm that day he he! Here is the recipe for it. Add oil in a wok. Once they get heated up, add the peppers and cook them for 3-5 min. Remove and keep aside. Repeat the same for carrots, cabbage and mushrooms. Cook them all separetly and keep aside. Shallow fry the tofu cubes and keep aside. To the remaining oil in tha wok, add the garlic, ginger. Stir for a min. Now add spring onions and cook for a min. Add sugar and let it caramelize. Now add the stir fried vegetables, mushrooms and soya sauce. Saute for a min. Add the cold rice and keep mixing them. Bring them down to room temperature. Mix in the tofu and salt. Garnish with fresh spring onions.Serve hot. I love fried rice..I'd like to be home for that dinner..looks great! 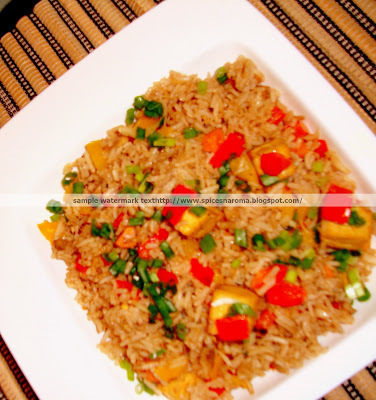 fried rice looks yumm..have to try adding tofu..never done that..sounds good.. Thanks for visiting. Stir fry sounds great although I have never tried tofu before. Fried rice is such a quick & satsifying meal.. like the addition of tofu cubes. U have a nice space on web. My first visit here had a good time. Yr fried rice looks so delish and colorful. I am a sucker for anything with veggies & rice! looks lovely! Welcome after a long break. Fried rice is looking gud. It has a lovely color to it. Thanks for your wishes Vij.. hope you are doing good and had a nice Diwali. Its great that you have rejoined the blogosphere, welcome back dear. Belated happy diwali to you and your family. I have never used tofu and mushrooms in fried rice, but you gave a good idea for that. Tried out this recipe. It def tastes yummm but mine dint get the red colour :-( What did you add for the colour?